Ball bungees are fairly simple pieces of equipment when you think about it, but that doesn’t mean they don’t have an impressive list of diverse uses. If you’re not familiar with what we’re talking about, these ball ties are also sometimes called bungee balls, toggle balls, or ball bungee snuggers. They’re just a short piece of rubber bungee cord that’s looped up and knotted inside a small plastic ball. We added bungee balls to our website a few months ago and have been hearing about lots of different uses for these handy tie downs from our customers. Tie on a loose bumper or other car parts temporarily after a car accident. This should only be a temporary solution – but it can help get the car out of the street and to the mechanic for a more permanent solution. Keep a car trunk, or truck end gate bungeed shut when you’re hauling something oversized. Tying down a tarp over virtually anything – especially when hauling on a trailer. Add extra security to equipment you need to strap to the top of a vehicle. Grouping together tools, stuff in the garage, or even straight items like skis, ski poles, or fishing poles. For setting up small tarps or other ground cover over outdoor plants and trees to prevent freezing. Secure a gate closed when the latch has broken. Tie down a lid on a garbage can or recycling bin. Secure lids on pet food to keep unwanted animals and pests out. Attach Christmas lights or other decorations to fences, posts, etc. Loop around garden hoses before storing away for winter. Loop around handles on suitcases or other luggage pieces so you can attach ID tags and find them quickly at the airport. Secure flags on snowmobiles, ATVs, etc. Secure around pant leg before putting on snow boots to keep pant legs tucked in. Tie down a cooler inside a tractor cab to keep it in place. Bundle hockey sticks or skis together to make them easier to carry. Secure around rolled up outdoor carpeting to keep it tight while in storage. Secure a camera to a solid object to use a tripod. Add extra tie down points when using a cargo net. Hang tarps when doing home improvement projects to keep mess contained. Secure pet crates inside vehicle to keep them from sliding. Loop one around your phone and attach to your belt, backpack, etc. when outdoors. Gather and secure extra long extension cords, computer cords, media cables, etc. to keep them neat and managed. 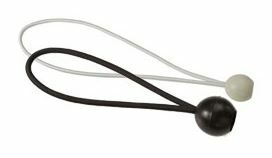 You can find bungee ball tie downs in our bungee cord category on US Cargo Control: Bungee Cords. Have you used these handy bungee ball cords? Let us know how and we’ll add it to our list! Better yet- send us a picture; you just may see a blog post about it!